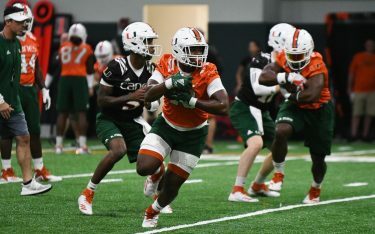 After last Saturday’s dismissal of redshirt junior defensive end Al-Quadin Muhammad and senior linebacker Jermaine Grace, it’s back to the drawing board for Head Coach Mark Richt and the rest of the Hurricanes coaching staff. With only a few days before Miami’s home opener against FAMU on Saturday, the Canes have some big shoes to fill. Muhammad had 54 total tackles, a team-leading five sacks and 8.5 tackles for loss last season. Grace, who started every game last year at linebacker, led the team with 79 tackles as well as two sacks and six tackles for loss. Diaz is not allowing his defense to feel sorry for themselves – there is just too much on the line. Now the question for the Canes: who is the next man up? The team has options to fill in for Muhammad on the defensive line, making that absence the simpler of the two to solve. Trent Harris, the 6-foot-2, 250-pound junior, is likely to get the majority of the reps opposite of starting junior defensive lineman Chad Thomas. Harris, who played in all 13 games last season, finished sixth on the team with 49 tackles and 3.5 sacks. However, Harris’ status for FAMU remains uncertain because of a hand injury suffered in practice on Tuesday. Help up front could also come from 265-pound redshirt sophomore Demetrius Jackson. Jackson saw action in seven games last season, finishing with 11 total tackles and 2.5 tackles for loss. Contributions might also come from freshmen Pat Bethel and Joe Jackson. Both players are four-star defensive line prospects who excelled at the high-school level, ranked No. 111 and 182 respectively by ESPN300. Filling the hole made by Grace’s departure will be slightly more difficult because the team will choose from a pool of inexperienced freshman linebackers. 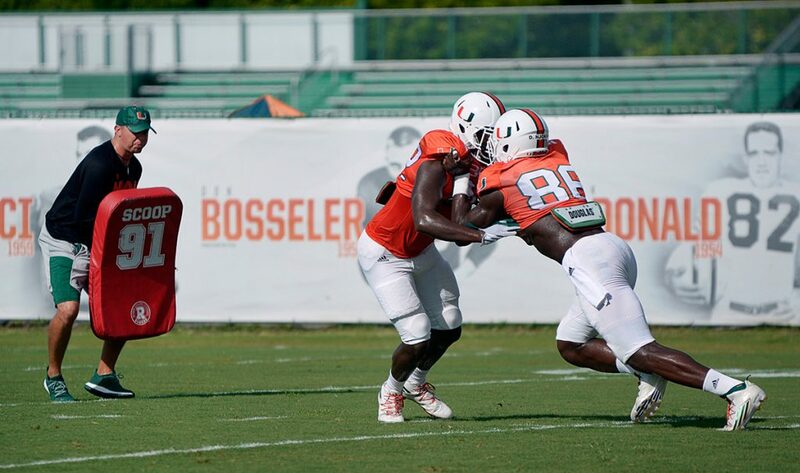 Freshman Shaquille Quarterman is slotted to man the middle of Manny Diaz’s 4-3 defense. Quarterman, the Florida native who stands 6 foot 1 and weighs 240 pounds, is a four-star prospect and ranked No. 98 on ESPN300. Quarterman, who earned the Florida Times-Union Defensive Player of the Year honors his senior year, amassed 412 tackles, 23.5 tackles for loss, six sacks and two interceptions over his high school career. The Canes may also turn to freshmen Zach McCloud and Michael Pinckney. McCloud was a four-star prospect who ranked as the No. 172 player on ESPN300. While Pinckney, a consensus three-star prospect, totaled 85 tackles, 10 tackles for loss and eight sacks in his senior campaign. 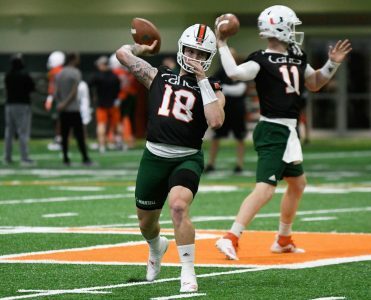 Redshirt freshman Jamie Gordinier and sophomore Charles Perry provide Miami with players who experienced being a part of the program last season. While Gordinier didn’t see any game action, Perry played in nine games and could be tested early. Regardless of who fills the openings left by the dismissal of Muhammad and Grace, the Hurricanes coaching staff remains optimistic and has their eyes set on FAMU on Saturday to open the newly renovated stadium.